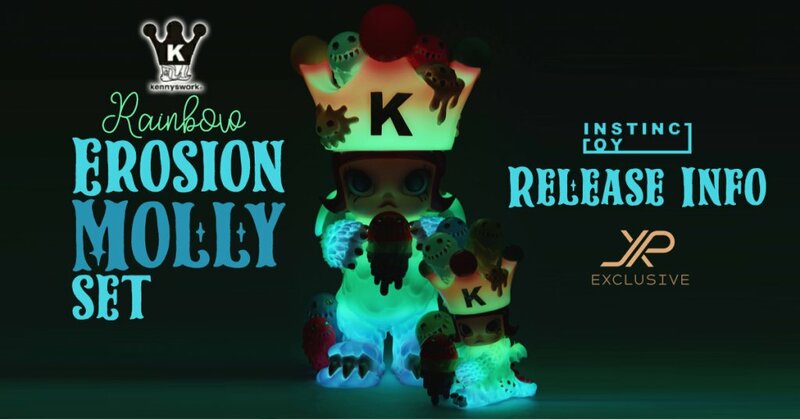 Its only been less than 24 hours since the announcement of theJPX Exclusive Rainbow Erosion Molly by Instinctoy x Kenny Wong and the release info has been officially released. As well as the release info, JPX has confirmed this will be sold as a set which includes the Mini Rainbow Erosion Molly. Here she comes! Big and bright and glows in the DARK. A couple of days ago we showed you a tease via our Instagram account HERE. In the early hours of this morning, Instinctoy announced a little more insight to the release as well as introducing the latest edition of LIQUID 新色『Border Rainbow which matches the Rainbow Erosion Molly JPX Exclusive. Look closer at the photo below, do you see what we see? a MINI Rainbow Erosion Molly and she can glow too. We designed this new colourway using the same colors as the liquids on the crown of the 8th “Rainbow” Erosion Molly, which will be released as a JPX exclusive. (JPX is a toyshop in Thailand. )We will sell this new edition of “LIQUID” at the WF INSTINCTOY booth. This edition will be available only at WF this month, BTS in Sep and TTF in Oct. WF is going to be the only chance to get them in Japan. HOW TO ENTER: JPX will post a form at JP Toys Facebook HERE for the customer to fill in, each customer have to fill in the correct information to complete the order. JPX will randomly pick the lucky customers. This set includes 1 Molly erosion and 1 mini erosion all in rainbow GID. Limit 1 set per person. Receive in very limited amount. -Rules and regulations are subject to change without notice.